Another Christmas season is in the books. When I was a young child, I was enthralled by the concept of “chestnuts roasting on an open fire.” I nagged my long-suffering mother into purchasing a bag of these nuts and cooking them in our fireplace. That statement is remarkable for two reasons. First, we didn’t have chestnut trees on any family property, so she had no experience with the nuts. Mom was never eager to try anything new. Second, I can count on one hand (truthfully, two fingers) the number of fires kindled in our family fireplace during my childhood. Our house was built in the 1940’s and the tiny firebox was designed for coal-burning, not wood. As a consequence, a log fire billowed smoke into the house interior, stainining walls and incurring the wrath of the matriarch/housekeeper. Smoke fiasco aside, our carol-induced experiment took a bad turn when the nuts heated up. We did not know that we should have cut a slit in the hulls to allow for the escape of steam. Mom learned that an exploding chestnut makes a sound not unlike a pistol shot. The detonated nuts flew across the room, leaving trails of scalding hot innards. She attempted to remove the remaining nuts from the fire’s edge before they blew, with limited success. I learned a few new words that day. Even as a six year-old, I knew better than to laugh at a frazzled mother dotted with sizzling nut guts. Oddly enough, she was mad at crooner Nat King Cole and not me. Decades have passed. I have learned that, despite the similarity in seed appearance, the chestnut and the buckeye are markedly different. Chestnuts are edible. Buckeyes are not. 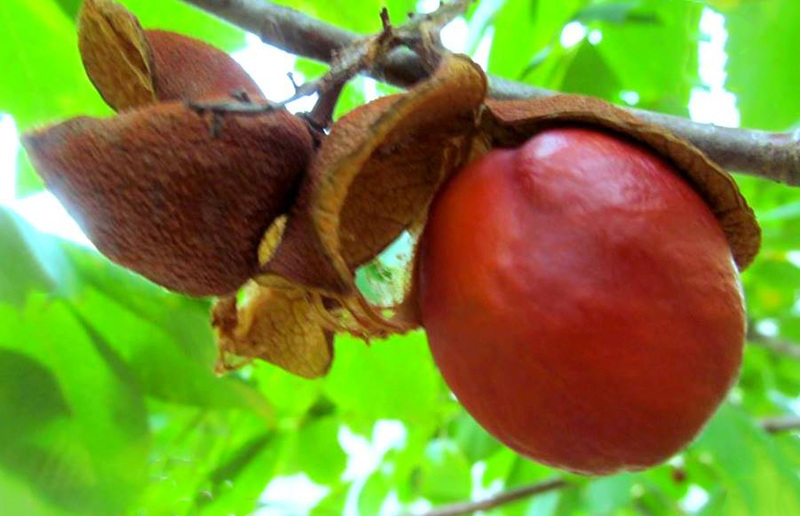 Ingesting a buckeye can cause kidney failure. Chestnuts are encased in prickly husks that remind one of Oscar The Grouch. Buckeyes are encased in spineless, lobed seed pods that look a little like a misshapen fuzzy brown kiwi. The subject of today’s blog is the Red Buckeye, Aesculus pavia, pronounced ESS-kew-lus PAH-ve-ah. This deciduous tree is native to the southeastern US. Its short stature (10 to 20 feet) and clump-forming habit leads the gardener to treat it as a large shrub. It is one of the first trees to leaf out in the spring and one of the first to shed leaves in the fall. Beautiful red bloom panicles up to six inches long are borne at the ends of the branches in early spring. The nectar-rich flowers are irresistible to hummingbirds and butterflies, and are ranked among the top ten hummingbird plants for South Carolina. Trees prefer moist but well-drained soil. They function best in an understory role with dappled shade, since the tender leaves scorch in full sun. The crown will open up a bit in denser shade. They do not tolerate severe drought, but will die in a waterlogged soil. The seed pods open to release mature nuts in September to October. It is possible to start Red Buckeye from seed, but you’ll need to work fast to beat the squirrels. The seeds degrade quickly once shed, so should be planted as soon as they are gathered. Seeds require three months of cold, moist stratification to germinate. This can be accomplished by refrigerating seeds in a bag of damp sphagnum moss before planting them in the ground or in a nursery container. The easier method is to place seeds in a porous potting mix outdoors through the winter, allowing Mother Nature to do the chilling and watering. If you take the latter route, use protection (wire mesh) to prevent squirrels from unearthing the nuts. The potting mix must be free-draining or seeds will rot. Seedlings grow quickly and can flower in two to three years. Carrying a buckeye in the pocket is supposed to bring good luck. Just don’t eat it. Photo courtesy of Josh Williams, from the Clemson Extension Home Garden Information Center. See Bulletin 1031 for information and photos of Red Buckeye and all its relatives. Red buckeye, ready to drop from its seed capsule.